Every city, every town has a distinct character. Be it Dostoevsky’s sensationally sombre Petersburg, Camus’s enchanting Algiers or even the fictional Malgudi created by our very own R. K. Narayan, every city charms its dwellers and its visitors differently. So, this week’s theme for Toehold Power of Photography Contest is ‘Cityscapes’! Share with us some brilliant images you have made depicting the theme! The Contest is open from today, 3 December, until Sunday, 9 December. 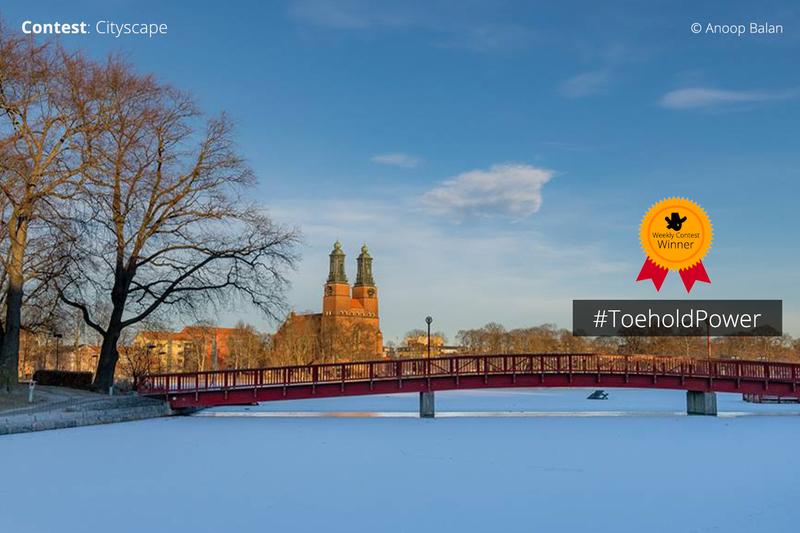 — Do NOT forget to add the hashtags #ToeholdPower and #Cityscapes! That’s the only way we can find your entry to this contest. That’s it! The deadline for the contest is 11:59 p.m. IST on 9 December. Winners will be picked and announced by 12 December, Wednesday! The winner of last week’s Power of Photography Contest with the theme ‘Cityscape’ is here! This delightful image is made by Anoop Balan! Congratulations, Mr. Balan.